You can extend the life of your glove with just a little extra time and effort. Golf gloves take a beating. The soft and supple leather has to absorb sweat, the wear and tear of gripping a club, and swinging it, along with the unsavory conditions presented by a golf bag commonly left in the car trunk or the garage. 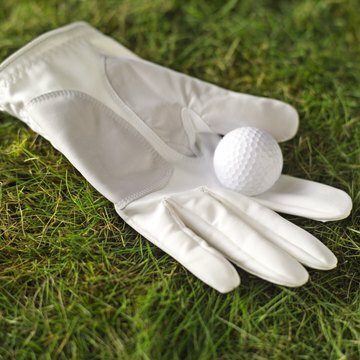 Because of these factors, golf gloves tend to break down quickly, creating holes and the need for a replacement. You can keep the leather on your glove from breaking down by washing your golf glove. All it takes is a little time and effort. Rinse the glove off in cold water. You'll want to remove any dirt on the surface of the glove and get the leather thoroughly wet. Fill your bucket with cold water and approximately 2 tbls. of dish detergent. Put your hand in the water and stir it up to activate the soap and create suds. Place the glove in the water and swirl it around. Use your hand to agitate the soap in the water, allowing the motion to remove ground in dirt particles and sweat. Wash out the more hearty stains and deposits by placing the wet glove on your hand and then lightly scrubbing on the leather with a hand towel soaked in soapy water. Rinse the glove in clean, cold water, removing all the soap, which can dry out the leather if left on. Place the glove on a dry hand towel and give it a couple of hours to begin air drying. Place the glove back on your hand after two hours of air drying. This will help to stretch the leather, preventing it from shrinking. Take the glove off your hand and allow 12 hours for it to finish air drying.